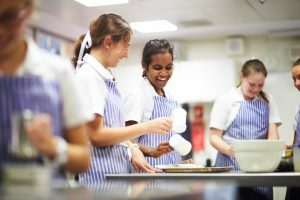 The Vocational Education and Training pathway allows girls to gain a nationally recognised qualification, which can be a springboard to higher qualifications and / or employment. Vocational Education and Training (VET) at PLC links school to industry, significantly assisting VET students to gain employment, pursue traineeships or apprenticeships, or continue on to Certificate or Diploma Courses at TAFE or other Registration Training Organisations (RTO). VET pathways include studying ATAR or General subjects or a combination of these subjects, while some students undergo a school-based traineeship or apprenticeship along the way. The traineeship pathway is an excellent way to focus thinking and direction towards a possible future career. School-based traineeship / apprenticeships run parallel to the school subjects selected, generally requiring one day per week “on the job”. In addition, time at the RTO may be required if the trainer does not visit the school or the workplace.